Libertine Fine Art Gallery engaged the St. Petersburg Group to launch four limited edition giclée prints celebrating luxury sports car brands by renowned artist Timothy Raines. 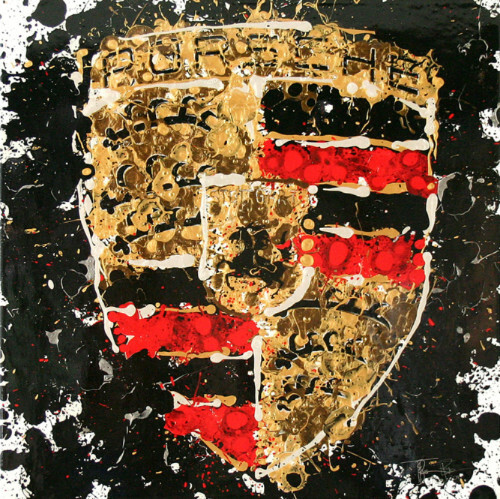 Raines’s art explores brands, luxury and sport, utilizing a technique that drops of paint from varying heights to splatter color on the canvas below. His reimagination of luxury logos caught the eye of The Robb Report, a luxury-lifestyle magazine that hosts an annual Car of the Year event in Napa Valley. Raines earned an invitation to display his art at the exclusive 2018 Car of the Year (COTY) event. Displayed at this year’s event were Timothy Raines’ striking portrayals of Porsche, Aston Martin, Lamborgini and Ferrari logos. The four limited edition giclée prints of his work can be found on the Libertine Fine Art Gallery website here.